Christmas has come and gone and we are beginning a new year, so what better way to start it off with some fresh new decor. 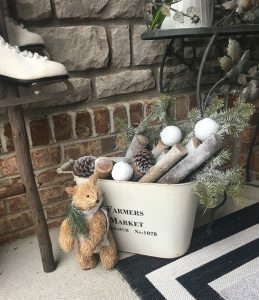 I decided to keep the Christmas magic alive as long as possible by transforming my Holly Jolly front porch into a white winter wonderland. After all, with the dreary days of winter still looming, who couldn’t use a little more magic, and what’s more magical than snow? 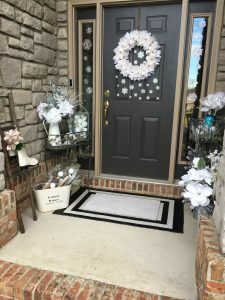 Here’s a photo of my front porch decked out for Christmas. All the details can be found on this post. To change out the decor from Christmas to Winter I began by removing anything obviously Christmas. 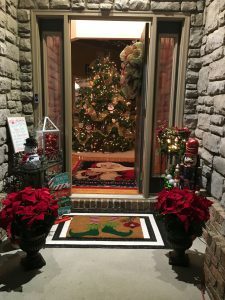 The wreath, the signs referencing Santa and the North Pole, and the red and green decor were the first things to go. I changed out the red and green Christmas wreath for this lovely white one my son bought me as a Christmas gift. This wreath came from Michaels, but one that would equally gorgeous can be found here. I love that it’s mostly white, but includes subtle hints of blush. This will help me slowly transition to spring when the time comes. 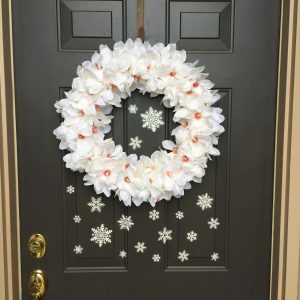 I added removable snowflake decor to the door to give the wreath a more snowy feel. 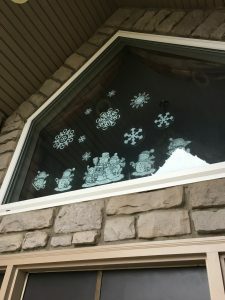 A similar set of snowflake stickers can be found here. 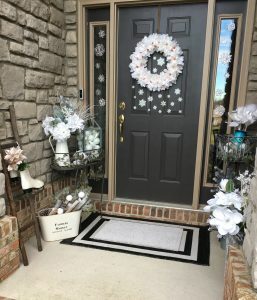 Again, when it’s getting closer to spring, I will simply remove the snowflakes and keep the wreath. Since my budget isn’t unlimited, I love being able to reuse decor pieces. 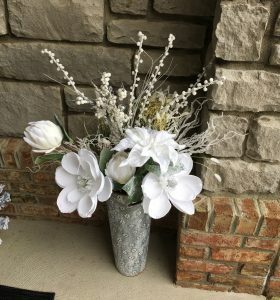 I added these cute white floral pieces to my Homeologie pitcher. 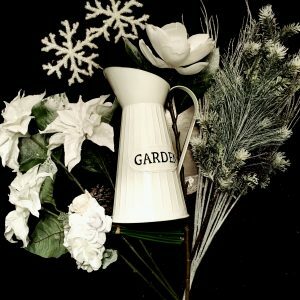 The pitcher says “Garden” on one side, and for spring, I will absolutely turn the piece so the label shows, but for winter I turned the piece where the word faced the back so it wouldn’t take away from the snowy goodness. I love how versatile this pitcher is and I have plans for it in the spring and beyond. 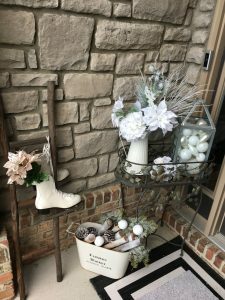 Many of these items were used in other locations for my Christmas decor. 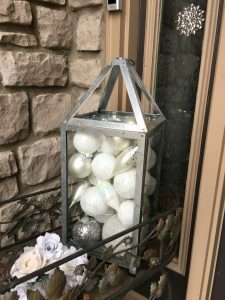 The white and silver ornaments were in a cute sleigh and some were also used to adorn my dining room chandelier, you can see those photos here and here. Again, since my budget isn’t unlimited, I needed to reuse pieces but in a fresh way. I replaced the potted poinsettia with this rustic ladder and hung a pair of ice skates over it. I added these icy blush flowers to the ice skates to give just a bit of color to this area. I kept the theme very snowy by using predominately whites but added a few touches of blush here and there. These should help me slowly transition this area to spring in the coming months. I replaced the potted poinsettia on the other side of the stairs with this metal vase from Michaels spring line. 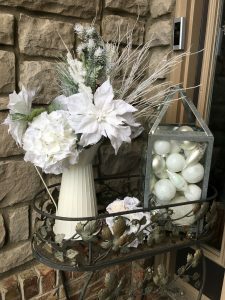 I love how the silver and white colors look with my all white flowers and I love how this will easily transition to spring as I add more colors of flowers and take away the white snow-covered ones. In the back corner I removed my nutcracker – also from Michaels – and my DIY Christmas decorations. You can see how I made the ornament tree here and the Christmas ornament basket using a plant stand here. I kept the plant stand, and added some spray snow to the greenery. Inside this I added this beautiful vase my daughter painted for me. 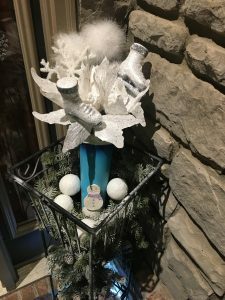 I filled the vase with white flowers, sparkly snowflakes, and a couple of floral pick ice skates that had been in an arrangement inside during Christmas. 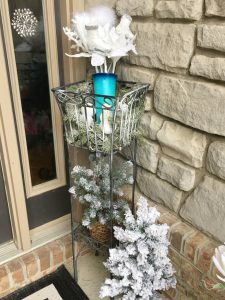 Beside and beneath the plant stand I added two flocked mini trees. One is from Michaels and the other Bed, Bath, and Beyond. Similar ones can be found here. I swapped out my cute little elf feet rug for this plain one I painted with white spray paint. The mat I began with is similar to this one. 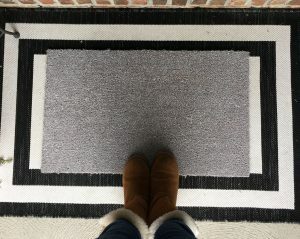 I had planned to add another coat of paint so that it really looked white, but when I saw it like this I decided to keep it because to me it really looks like a normal doormat covered with frost. 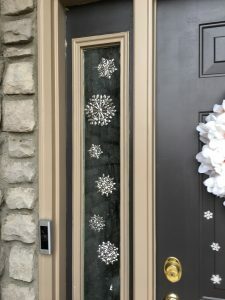 Often it’s the little things that really finish off a design so I added these silver snowflake decals to the sidelights and these cute snowmen and snowflakes to the large window above the door. The look ended up exactly what I was going for and my hope is that it will keep the excitement of the season alive a little longer by featuring the magical look of snow instead of the basic blah of winter. Thanks for visiting. I hope you have enjoyed these ideas. Don’t forget to sign up for our newsletter and follow along with us on Pinterest and Instagram.